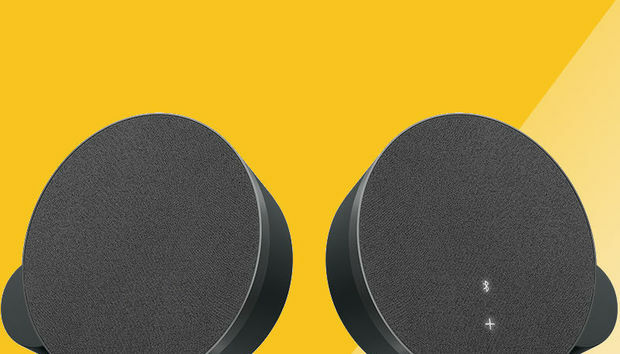 Logitech’s MX Sound 2.0 Bluetooth speakers join products including the MX Master mouse, Craft keyboard, and Brio webcam in the company’s premium computer accessory line. At $99, they’re a not-unreasonable upgrade over your PC’s speakers that can double as audio output for your mobile devices, but ultimately their sound performance left us a bit underwhelmed. Though they’re described as Bluetooth speakers, they are clearly designed for the desktop. Each of the 6.3 x 6.3 x 3.8-inch (HWD) cabinets has a rear-facing bass port that does double-duty as a stand. 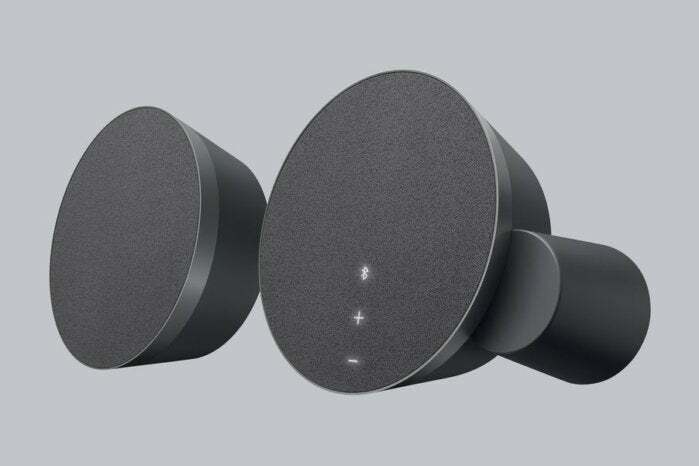 These give the speakers a 10-degree backward tilt that purportedly puts the listener in an audio sweet spot when they’re sitting at a computer. The speakers connect to each other via a 3.5mm audio cable that’s hardwired to the left speaker and plugs into an RCA port on the right one. Also on the back of the right speaker are a connector for the AC power adapter and 3.5mm ports for PC and auxiliary audio input and headphone output. MX Sound's rear-facing bass tubes were a little too effective. MX Sound’s Bluetooth support allows you to wirelessly connect your phone or another device and stream music to the speakers, even when it’s wired to your PC. This is simple enough: A motion sensor in the right speaker detects when your hand is a few inched in front of it and illuminates an otherwise invisible Bluetooth pairing button and volume controls hidden behind the mesh covering. Lightly touching the Bluetooth button initiates the pairing process. You can pair up to two Bluetooth devices to MX Sound simultaneously, and Logitech’s Easy-Switch technology allows you to toggle between them without hassling with an input switch. You just press Pause on one device and Play on the other to change your music sources. Note that a Bluetooth connection doesn’t deactivate the 3.5mm input. This is ostensibly so you can still hear alerts from your PC, but it also means if you come upon an auto-play video on your desktop while you’re streaming tunes from your phone, you could experience a cacophonous mash-up. With 24 watts of peak power (12 watt RMS), MX Sound delivers rich sound with clearly defined stereo separation. But those bass tubes do their job a little too well. While the thump they deliver is satisfying when gaming or listening to bottom-heavy genres like dubstep, more often than not the bass overwhelmed, smothering the highs and muddying the overall sound. MX Sound is a decent 2.0 speaker system for the price. As a general PC accessory for casual gaming, movie watching, and music streaming, the speakers are marked improvement over built-in audio, and the convenience of Bluetooth support will likely make them extra attractive to many users. But while the bass blew us away, the overall sonics didn’t, and that makes them tough to recommend for serious music listening.